Savoring chocolate is one of life’s greatest pleasures. What if you could turn that feeling into a passion, or a new career? Founded in 2003, Ecole Chocolat Professional School of Chocolate Arts offers programs in chocolate making that will help you explore your love of chocolate as a hobby or a business. Our core programs are offered online, so you can learn anytime and anywhere that works best for you. Our dedicated team of instructors and tutors have decades of experience in the fine chocolate industry, and they share their expertise with you through our interactive online learning platform. You’ll learn the knowledge and techniques to make fabulous chocolate and develop your own chocolate recipes. You’ll also be connected to a unique community of chocolate lovers as you share your experiences with your classmates. Our instructors have helped hundreds of students from around the world explore their passion for this delicious craft, and we’d love to do the same for you. We know what you might be thinking – how can you teach chocolate making online? We've been doing just that for 15 years, here’s how. Intrigued? Here’s how you learn more and get started on your journey. 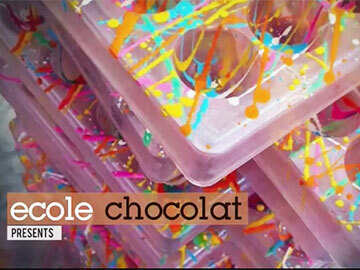 You have two options – are you interested in chocolate as a business or a hobby? Ecole Chocolat's intensive chocolate-making programs and chocolate classes prepare you to find your place in the fine chocolate industry. Whether you aspire to work for yourself or in a professional organization, our chocolate school's specialized curriculum is just what you need. Our many years of experience in award-winning, university-level online education ensures that your learning experience is intensive, comprehensive and enjoyable. We believe in "experiential education" which is defined as active student engagement in opportunities to learn through doing and reflection. This empowers our student to immediately apply theory to practice under the guidance of an online tutor. We hope that you will choose one of these programs and start your journey into the world of chocolate. Before you know it, you'll be a chocolate connoisseur! If you have any questions, please don’t hesitate to contact us – we’d love to hear from you. Need a gift for someone special? Learning to make chocolate is the gift that keeps on giving! Visit our gift certificate page for more information.